We meet every Tuesday evening . Doors open at 7.00 pm, so it is best to arrive between 7.00 and 7.15 to give yourself a chance to settle in before we start very promptly at 7.30 pm. 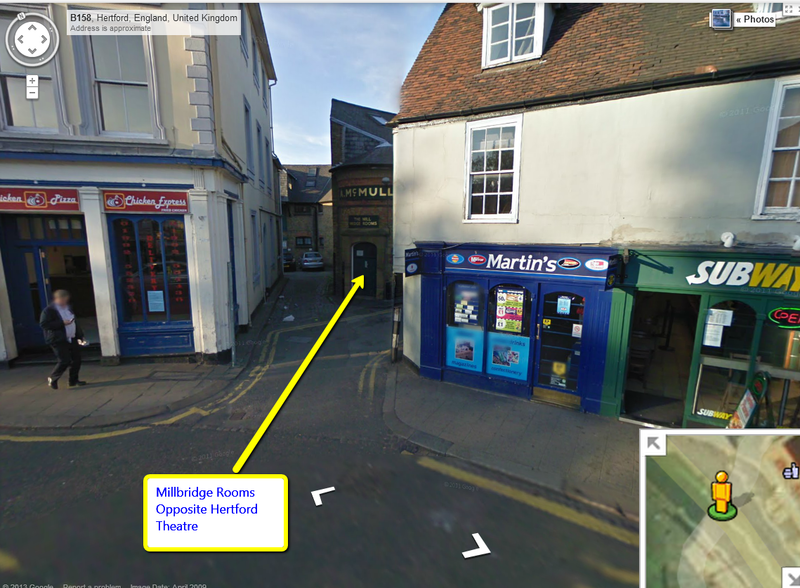 The location is the Millbridge Room, Maidenhead Yard, Hertford, SG14 1PT (opposite the Hertford Theatre). It’s set back from the main road, between the take-away and Martins newsagents. The building is a Victorian seed warehouse formerly used by McMullens, the brewers. Street parking is often hard to find in Hertford. It is probably best to park in a nearby car park. We are right opposite Hertford Theatre, and their website has some good info about nearby car parks. St. Andrew Street is nearest. There is a short cut footpath from it by the side of the theatre. I think all the car parks are free after 6.30pm. There are spaces at St. Andrews 90% of the time around 7pm, but if it is full try Gascoyne Way. Quickest way to walk is the Post Office Way footpath which is shown as a grey line in the may below. It is also a relatively short walk (10 to 15 minutes) from Hertford East, and also Hertford North train stations. Everyone (including newcomers, and anyone just curious in finding out more) is very welcome to come to our classes; you do not need to think of yourself as a Buddhist to listen to the Buddha’s teachings (the Dharma) or to meditate. For introductory information on Buddhism click here. And click here for more information on meditation as well as all kinds of useful information. As you enter there will be somewhere to leave your shoes and outdoor clothing. There will also be a box for a donation towards the hire of the room and other overheads. The suggested donation for the evening is £5. If you cannot afford £5 that is fine, just pay what you can afford. The content of each evening will vary from week to week but there will always be a session of meditation with instruction and an explanation of some aspect of the Buddha’s teachings. There will also be plenty of time to ask questions and meet others over a cup of tea and maybe even a biscuit or two. No special clothing or equipment is required; mats, cushions, and chairs will be provided. We would suggest that you dress modestly and comfortably and possibly refrain from eating too heavily beforehand and this can be a recipe for a very dozy period of meditation. I came across this page which I thought was interesting. It is a page on the BBC website that interviews 10 people who have no religion, but who have a spiritual side. Unfortunately in our culture, a lot of people like that do not get a chance to explore their spiritual side in a deep way with a spiritual community of friends. I think this is a pity, as I have personally found that exploring this with other people adds a lot to the richness and depth of the experience. And that is what is what we are trying to do at the Hertford Buddhist Group. There is not "God" in Buddhism, and it is definitely not about believing in anything, or having to take things on blind faith. Therefore many people say it is not a religion. It is about having a context with friends to explore our own experience, and practise what we have found to work to help ourselves become more conscious and kinder people. How does spirituality differ from recognised religion? Ten people explain what it means to them. I am normally pretty unorganised, but somehow I have the next two and a half months planned for Tuesday nights. We have another course coming up at Hertford Buddhist Group 17/4. The next one will start in September. These are very popular, and the last one had 51 people on the first night, which is close to the capacity of the room. So please get there early to avoid disappointment. Everyone is also welcome to Thursday nights which are organised by Rob. There is a 30 minute silent meditation sit together on Thursday nights with no instruction, followed by a talk, or sometimes a devotional ritual. It is also suitable for seasoned meditators to come and to really go back to basics and give their practice a real boost. It will recap some of the teachings from the previous course and also introduce new items, so it really doesn't matter whether you came on that course or not. It's fine if you can't manage to come to every class, each one can be enjoyed independently so just come along to any that you can make. Although like anything, the more you put into it, and the more you attend, the more you will get out of it. We don't charge a fee but instead ask for a donation towards our costs. A suggested amount is £5 per session. A lot of people may come, and we only have limited spaces, so please get there early (anytime after 7.00pm) to avoid disappointment. taken on Monday after my kalyana mitra (spiritual friendship) ceremony at the London Buddhist Centre. It was taken in the garden of The Larder, which is the cafe next door. Nandaketu is coming to lead the Hertford group this Tuesday (20th March). After the meditation in the first half, he will be exploring and introducing a simple Buddhist ritual to us. He set up and co-leads the Hornchurch Buddhist Group, and I consider him my friend and teacher. You might be interested in his post below, where he talks about things he has appreciated, which is one of the exercises from the book "Journey and the Guide" by Dh Maitreyabandhu . as promised (or some might think threatened) here is the results of my following Maitreyabandhu’s five things I’ve appreciated today in my J&TG notebook. Surprisingly the highest number of things I wrote down were simple physical pleasures. This may be due to temperament, the habit of where I put my attention or the result of doing a lot of physical training recently. It included things like the exhilaration of feeling secure in a parallel bar shoulder stand or the relief as long term tension patterns in my body are released by deep stretching (Kit Laughlin’s methodology if you’re interested in this). The next broad area was ideas and realisations. Insights, new ways of thinking or understandings gleaned from cultural appreciation. I’m spending a lot of my time alone studying so it isn’t surprising. It did makes me realise how important decent mental stimulation is. Despite not seeing many people at the moment, the next category is people. Not people doing anything in particular but just for being themselves and being around. For example, Nigel’s company during the Parinirvana festival. The next closely related category is seeing kindness. This may be kindness directed towards me or witnessed to others. The internal feeling seems similar to that experienced when looking at natural beauty, such as seeing light flickering on waves; however, maybe because it is more active and human, I feel it more intensely. As the weather warms up I’m spending more time wandering the marshes and woods around where I live. I noted appreciating beautiful skies, gnarled trees and luxuriant foliage which often sets of reminders of more mythical aspects of life. It’s not just natural things though, human life especially seen from a distance, can look wonderful: such as the lights over the industrial area near where I live or the centre of London as I drive to the London Buddhist Centre on a Sunday night. Another category I’d call mastery. It is just the satisfaction of doing something well. Cleaning the kitchen, getting all the shopping done or creating a new website. I experience this with music too, improvising a little tune or knocking up a composition using music software. Of course everything doesn’t fit into neat categories. I really enjoyed Nancy’s peanut cookies but is that physical sensation (they taste good), kindness (she generously baked them for us) or the excitement of an idea (you can make biscuits with my favourite food). Your lists may be quite different. The balance will likely be different according to habits, lifestyle and temperament. I may have missed, through mindfulness or lack of appreciation, whole areas of experience – please let me know if you feel this is the case. Mostly I hope it has stimulated you to keep trying (or start trying) this simple exercise. If nothing else, you go to sleep with a better appreciation of life, and of course this outlook may well perfume your dreams! Here is a 3 second video from Vajragupta's visit on Tuesday. He really enjoyed meeting us, and will hopefully come again. He sent an email saying "I really enjoyed visiting the group... a great bunch!" I asked him where he got it from, and he told it was from chapter 4 of the book "Mindful Emotion - a short course in kindness" by Dr Paramandhu Groves and Dr Jed Shamel. There is a 20 minute guided meditation you can listen along to at https://kindnessbehaviourtraining.com/downloads-chapter-4/ . This book goes through different methods of doing the metta bhavana, so it might be of interest if you wanted to deepen your practice of this, or were having difficulties with it. 22/3 - Leah - First Reminder - "The preciousness of human life"
29/3 - not sure yet who is leading - "The impermanence of the body." We have chosen his excellent book "Buddhism: Tools for Living Your Life" https://www.amazon.co.uk/Buddhism-Tools-Living-Your-Life/dp/1899579745/ref=la_B0034OB71K_1_1 to study together for the past two years because it has incredible depth, but also presents the ideas in very simple language. Also it does it in a way which facilitates us exploring the path together, and discovering the truth for ourselves rather than having it rammed down our throats. He has also written several other excellent books: "Sailing the Worldly Winds", "The Triratna Story" and has just released a new one "Wild Awake" about his experiences on solitary retreat. His visit is probably a one off. I have been personally been inviting him for about two years, and his schedule has thankfully finally made it possible. This is a picture we took last Tuesday after the class. You can drop in from 7pm to 7.20 pm on any Tuesday night of the year (apart from Christmas). Newcomers are especially welcome, as are people who have not been for a while (and of course everyone else!). I have been inviting him to come for the last 18 months, and it is probably a one off, as he is very busy going round supporting different Buddhist centres and groups all over Europe, as well as writing books, going on and leading retreats etc. What is going on in Feb. Exciting news. Our friend Vajragupta (who wrote the book we study sometimes) has said he will probably be able to visit us - probably in February and March. I don't know yet exactly when he will be able to visit but I will send out another email when I know. But it will be a one off, so try and come if you can!